Jacqueline: As an adult woman--and the vice president of a marketing firm--I shouldn't be waiting by my office window to ogle the mystery man who jogs by every morning at 11:45. Sure, he's a gorgeous, perfect specimen of the human race, but I can't bring myself to hit on a total stranger. However, my best friend-slash-colleague Vince Carson thinks I should do more than talk to the guy. In fact, he's borderline obsessive about "getting me laid." (His words.) But the more time we spend together, the more it's clear: The one I'm falling for is Vince. Vince: Jackie Butler's got it bad for some pompous, over-pumped A-hole who struts his stuff past her window. That doesn't bother me. I know she deserves nice things. What does bother me is that she friend-zoned me big-time last year, so I can't ask her out myself. But what if I set her up with Mr. Steroids? Then, when he breaks her heart, I can swoop in and save her like the nice guy I am. Everything's going according to plan . . . until we share a ridiculously epic kiss. And suddenly anything is possible. Last year, I was introduced to Jessica Lemmon's writing and I truly enjoyed her Billionaire Bad Boy series. Unfortunately, the first title in her new series didn't have the same appeal. 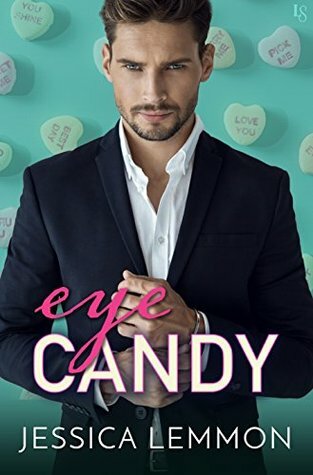 Eye Candy caught my eye--cheesy, I know--because of the best friend to lover's trope, and while there were good moments between Jackie and Vince, the divorced best friends and cowokers who discover they want a romantic relationship, there were also some issues of the plotlines and characters' behaviours that kept this from being more than just an enjoyable read for me. I liked Jackie enough. She was independent and smart, and she was a good friend to Vince when he needed her most, right after he got his divorce. She also had my sympathy for the whole cheating drama with ex-girlfriend. Vince, on the other hand, wasn't my favorite character. I didn't dislike him, but he didn't do it for me. He acted a little too imature at times, and his plan to get Jackie to go out with him didn't make any sense. I didn't see how a man could think getting the woman you're interested in to ask someone else out would benefit him. The whole "she refuses to date thing" didn't even seem real enough to justify that approach. For me, Vince's games (including the whole coaching thing after they started going out) didn't make much sense, and was only there to create drama. It didn't feel genuine, and that kept me from fully enjoying this book. Having said that, I thought there were some good scenes between them before and after they started dating. I always enjoy reading about healthy friendships between female and male characters, where they simply get to enjoy each other's companies while watching a movie or sharing a pizza. I almost wish we'd seen more of them as just friends before jumping into kissing. I also enjoyed Jackie and Vince's friendship with other characters. I liked that they had other people to give them advice and cheer for their happiness. The chemistry between Vince and Jackie was another win. They shared some hot moments together. Overall, this was an good read with nice elements to it. Had Vince's motivations and their communication been a little better, it would've been another win for this author, as far as I was concerned. *If you liked this review (or not), if you read the book (or not), come say hello and leave your comments bellow.